I ran across a great preprint while I was plundering the literature to write a presentation on bio-sourced materials last week. 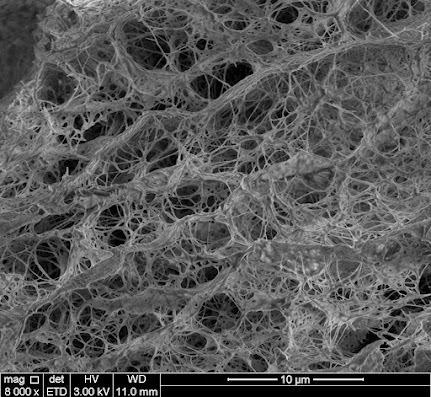 (I had posted an image on G+ from that presentation of some biologically-assembled nanofibers that I’d made, which I now include below just because of its beauty.) For my talk, what I learned from this preprint got rolled up into an almost throwaway comment about efficiency and yield, but that just doesn’t do justice to the thoughts it provoked. The preprint, entitled The Statistical Physics of Self-Replication, was by Jeremy England of MIT and was a joy to read. The preprint contained a rough estimate of the lower bound of heat energy generated due to bacterial replication. What was thrilling about this paper to me is that it is exactly the kind of thought process and calculation that drew me to physics as a field of study. There is something vital and important, not only for the process of science but for sheer satisfaction, about putting a limit on something. This process of putting a stake into the ground and saying “I believe it stops here” is a challenge to the world at large. In that challenge, you are daring the world to either prove you wrong or carry it to the next level. The paper might not be accurate. There were some assumptions made that may or may not be good ones. To some extent, that matters less than the fact that someone is making the calculation. The paper is also a reminder to me that when I do the same sort of calculations for pleasure, I ought to consider putting more work into them, to see what’s been done before and to see if I have anything unique to add.